From Mesa to Scottsdale, from Tempe to Tucson, from Glendale to Chandler, the Phoenix-area is blanketed with professional home painters. Phoenix homes, especially exteriors, are known for their bold and vibrant coloring. Whether you're trying to enhance your home's curb appeal or show off your home's beautiful interior spaces, you should consider hiring a Phoenix home painter for the convenience and quality of their work. When it comes to exterior painting, Phoenix is a tougher nut to crack than many cities. Sure, you might not have the high moisture levels or freezing temperatures that you'd find elsewhere, but direct sunlight can be just as detrimental when it comes to exterior painting. Phoenix homeowners looking to increase their curb appeal with a fresh coat of paint need to be particularly careful about the brand, type, and quality of the products they choose. While Phoenix house painters are very well versed in which paint varieties resist fading, chipping, and cracking, most homeowners should consider some serious research if they plan on doing the job themselves. Interior house painting, on the other hand, is a project that most homeowners can undertake on their own. It doesn't involve climbing ladders or dealing with the elements. Still, few homeowners relish the idea of tackling the project of painting the entire interior of their home. Particularly for new homeowners, who want to start from scratch and make their new home their own, hiring a professional painter to alleviate the already stressful process of moving can be a godsend. Just as there are in any other major city, there are bound to be disreputable characters offering less-than-satisfactory services in and around Phoenix. House painters are not disreputable by nature, but the fact that just about anyone with a paint gun and some scaffolding can claim they paint houses for a living does lead to some problems! Finding a great price is always a worthy goal, but getting estimates from several different Phoenix house painters is going to filter out any undesirable companies as well as give you a good idea of what the going rates are. If you don't plan on doing your own painting, take some extra time and talk to at least 3 (but preferably 4 or 5) Phoenix house painters before you hire one. To decide whether it's worth it to hire a professional painter, you'll need to understand the cost of house painting. 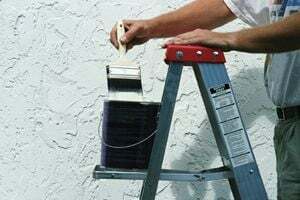 Many homeowners are surprised by how much it can cost to hire a professional painter, although this cost includes the several hundred dollars (as a best-case scenario) it will cost to buy the paint and supplies to paint the house yourself. Many homeowners are reluctant at first, but by the time the project is finished, they couldn't have imagined doing it any other way. The true upper limit of your house painting project is, naturally, determined by the size of your home and the needs and tastes of your home decorating. The homeowner who spent $9,000 on interior house painting, for example, had a 4,200 sq. ft. home and hired an interior designer to help with color selection. That said, however, the interior designer cost only $225 for three hours, and helped the homeowner pick out the entire color palette for his home. Don't be surprised if the house painters themselves are less responsive to helping you choose your colors. Comment: We need to have new cinder block/stucco walls in our back yard, and around our covered patio primed and painted. Comment: I need to get the exterior of my house painted. Phoenix Painting Contractors are rated 4.80 out of 5 based on 2,590 reviews of 100 pros. Not Looking for Painting Contractors in Phoenix, AZ?